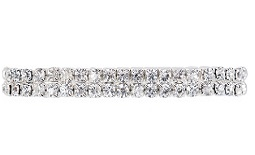 There are times when a simple tennis bracelet does not quite add that "wow factor" to your dress. You just need a little more sparkle to really pack the gown pop. Wearing 2 tennis bracelets is a bother. The solution? The 2-Row Stretch Rhinestone Bracelet. Two rows of dazzling rhinestones are set in silver-tone hardware. The stretch styling makes it east to just slide it on and go. FWO Extras: The approximate width of this bracelet is 1/4 inch wide.